The Jokhang Temple is widely considered Tibet's most sacred site. The golden Jowa Buddha statue is the most venerated religious object in the Jokhang Temple. It is a rare statue of Buddha when he was a 12 year old boy. This golden statuary was brought to Tibet by the 7th century Chinese Princess Wencheng as part of her dowry. The second best known object in Jokhang Temple is the eight spoked Dharma wheel that conspicuously sits atop the complex's main entrance. Each spoke represents one of the eight fold paths to enlightenment, a core tenet of Buddhism. Just outside this Jokhang Temple's gate are supplicants prostrating themselves as they slowly make their way to the entryway. Jokhang Temple has many chapels, mystically lit with yak-butter lamps, and sometimes graced with mantra chanting lamas. 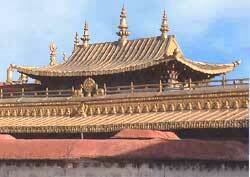 Other exciting facets of the Jokhang Temple include interesting roofs (see photo), courtyards, and ancient wall murals.